The Hobbit Coloring Book - ZineWiki - the history and culture of zines, independent media and the small press. 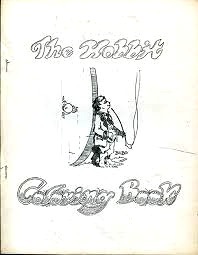 The Hobbit Coloring Book was a fanzine by Charles Brown and Marsha Brown. Appearing in 1969, The Hobbit Coloring Book was a one issue only release. Cover art was by Tim Kirk. Interior artwork was contributed by George Barr, Bonnie Bergstrom, Mike Gilbert, Howie Green, Eddie Jones, Tim Kirk, Dian Pelz, Joni Stopa (Gallimaufry), Don Simpson, Steve Stiles, Mike Symes, Bjo Trimble (Pas-Tell), Bernie Zuber, and others. Charles Brown also published the newsletter, later pro-zine Locus. This page was last modified on 9 August 2018, at 14:13.